The use of roof coatings has grown rapidly over the past decade and it generally involves cleaning and spray painting existing roofs fitted with clay or concrete tiles. The process of applying roof coatings normally involves cleaning the tiles, replacing any damaged ones, re-pointing the ridge and other cemented areas, applying a fungicidal wash and then spraying the roof with two or three coats of a proprietary coloured sealant or paint. There is no doubt that once treated in this way, roofs with clay or concrete tiles can look much better and provide added kerb-appeal and there are some very reputable companies offering this service. However, as with most home improvement products, there are claims made for roof coatings which are questionable in terms of the benefits they can offer, such as improved thermal efficiency. Some companies advertise that their roof coatings service comes at a fraction of the cost of a new roof, well so it should do. Tiled roofs should have a life expectancy of 60 to 100 years but if a new roof is really required, coating the old one will be no substitute. In the same way that a block paved patio or a pattern imprinted concrete driveway can be refurbished so can a roof, though granted it will take longer and require safety access equipment. Consequently, if you would like your existing clay or concrete tiled roof cleaning and colouring, you would be well served to base your decision on the premise that the real benefit is an aesthetic one. That way you will judge what you are prepared to pay solely on the improved appearance and not on any perceived improvements on the energy efficiency performance of the roof. 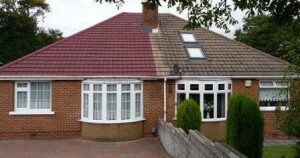 A roof coatings survey should include a complete assessment of all the work required to be carried out to make the roof coatings installation a success, including all roof tiles and ridge tiles to be replaced and if appropriate, whether a chimney or other areas of brickwork and cement areas should be re-pointed. The roof area should also be measured to so that the surveyor can calculate the materials and labour required to complete the job. Forming part of the quotation service, the survey should be free of charge. Once you have agreed to have roof coatings applied to your tiled roof, when the workmen arrive and the specification of the job has been confirmed, the first job is to erect scaffold or other access equipment so that a safe working environment is created and Health & Safety guidelines are followed. At this stage, all areas surrounding the roof, including the windows, doors and conservatory and any parts of neighbouring properties should be protected from paint splashes with a tarpaulin or other suitable cover. Since the coloured paint is sprayed on, care should be taken to eliminate the possibility of it being carried in the wind onto surfaces it is not intended for. The roof tiles are cleaned with a pressure washer to remove all dirt, moss, algae and lichen which has gathered over time. Again care should be taken not to direct dirty water and grime onto neighbouring areas with the pressure washer. After the roof has been thoroughly cleaned a fungicide should be applied to slow down any future damaging growth. A reputable roof coatings company would also clean and unblock all gutters and downpipes at the same time. Once the roof has been cleaned and a fungicide applied, it is a good time to replace all broken and cracked roof tiles and ridge tiles, re-point and re-bed the remaining ridge tiles, re-point any damaged cement areas and brickwork and check and repair flashings and lead work in valleys. Any tiles broken by the workers in the process of cleaning the roof should be replaced at the company’s expense. A reputable roof coatings company would have assessed all the repair work properly during the survey stage to eliminate any additions to the original quotation. However, a cowboy company may take advantage of this stage to increase the price. Installers then apply two or three coats of sealant and paint according to the specification of the proprietary product the company chooses to use and the formulation of each coat. Typically a clear microporous sealant is first applied which means that the roof remains water vapour permeable and is allowed to breathe. This is vital in allowing the roof to be capable of expelling any moisture from the inside to the outside in order to reduce the incidence of harmful fungal infections and mould growth. Either one or two coats of coloured paint are then applied. These are generally acrylic substances with additional binders mixed in and the paint should allow flexing of the roof without cracking or peeling as the tiles expand and contract due to temperature changes. The paint should also provide for excellent adhesion to the roof and ridge tiles, whilst remaining resistant to colour deterioration due to the effect of UV light in natural sunlight. If you are happy with the natural colour of your existing concrete or clay tiles, clear sealants are available which do the same job as the coloured paints. There are a number of proprietary products available which installers use in the process of roof coating and one particular product, Smartseal Climashield™ is available in slate grey, terracotta, deep tan, rustic red and slate green – all traditional colours for concrete an clay tiles. Smartseal™ is referred to elsewhere on this website as they also supply pattern imprinted concrete sealer, tarmacadam restorer and block paving sealer. If you are considering having your roof tiles cleaned and painted, it would be a convenient time to also have dry verges fitted to the ends of the tiles on the gable. A dry verge provides for the mechanical fixing of the tiles adjacent to a gable without the need for bedding them on mortar which can eventually crack during to freeze / thaw cycles. See the page on Roofline Products for more information.